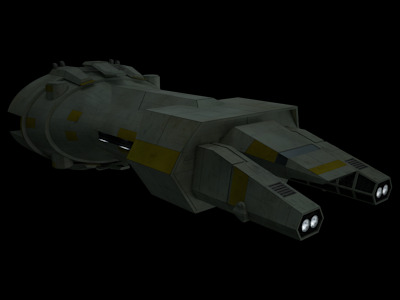 Designed as a cheaper alternative to the BFF-1 bulk freighter and GR-75 medium transport, the Brayl-class bulk freighter was intended to fill a gap in the market for those that needed to haul large amounts, cheaply. To achieve this low cost, the ship was given a relatively basic hyperdrive, no weapons and limited room for passengers. Even so, the designers still included adequate life support systems to maintain a crew of eight and support up to seventy passengers. Despite the ship’s drawbacks, the freighter is capable of handling a variety of cargo, making it popular with merchants selling goods of all types. However, due to the lack of defensive capabilities, those employing Brayl-class freighters often have to hire escorts for the more dangerous regions of space. The Brayl-class of ship is also prominent among conscious spenders and individuals or groups working on a limited budget. It is for this reason that they remain a common sight in many trade lanes, due also in part to the range of entities capable of filling the ship’s spacious cargo holds.